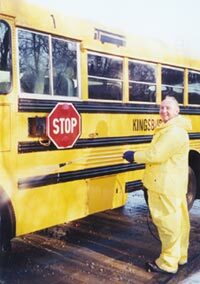 Kingsbury's "little yellow buses" run in convenient locations throughout northern Oakland county and southern Lapeer county as well as parts of northwest Macomb county. Kingsbury students come from 20 different communities and 25 different zip codes. If you live in Oakland, Rochester, Macomb, Romeo, Lake Angelus, Clarkston, Brandon, Oxford, Lake Orion, Metamora, Dryden, Lapeer and surrounding areas - there's a good chance a Kingsbury bus stop is close to your home. Bus routes are established in August of each year based on locations of our families.